Hello everyone! Today I'll be posting my final recap from my trip : Copenhagen. If you missed the other two, check them out: Mallorca and Sweden. Copenhagen is such a beautiful and fun city! I heard a lot about it before my trip, and everyone told me it was their favorite city ever. I went in with really high hopes, and most of them were met and exceeded. As usual, I'll be sharing some places where we slept, ate and explored. - The city was hit with 2 huge fires in the 18th Century. Because of this, there aren't a lot of medieval relics and older buildings that are common in Europe. To me, Copenhagen felt more like an American city than most European capitals, and is the main reason why I wouldn't call it my favorite city. - Copenhagen is home to Tivoli, the second oldest amusement park in the world. We sadly never made it inside, but it looked absolutely beautiful! The park's founder convinced the king at the time to build the park by saying "when the people are amusing themselves, they do not think about politics". - A fundamental aspect of Danish culture is "hygge". Hygge is a concept that evokes "coziness", particularly when relaxing with good friends or loved ones. It's a beautiful concept, and something that I definitely felt while strolling around the streets of Copenhagen! We stayed at the Generator Hostel, and I have to say it was my favorite hostel that I've ever stayed in. Generator is a chain of hostels across Europe, and this location was amazing! I loved the central location, and everything felt very safe. We stayed in an 8-bed mixed dorm, which had 2 showers, bathroom and sink. Each bed had its own locking trunk along with an outlet and light attached to the headboard. WIFI was available in the entire hostel and was reliable. The hostel had two happy hours a day where you could get a liter of Carlsberg for only 50DKK (about $7.50). Beer in Copenhagen was extremely expensive, so this was a great deal! They also had a full kitchen, breakfast buffet, and lots of social areas. My favorite was the hammock room (above) and the outdoor deck. The hostel also rents out bikes and has lockers that you can rent. We came in early to catch a walking tour, and were able to leave our luggage for a low rate. The employees were also really friendly and helpful, and we had absolutely no issues! My first international fast food experience was at MAX, and it was incredible. I try to avoid eating fast food (especially American chains) but Steven told us this was a must-try. The burgers tasted fresh and juicy, and their dipping sauces were so tasty (as they should be for 50 cents each!). Fun fact: Max is Europe's oldest hamburger chain! We visited the bakery Lagkagehuset quite a few times and for good reason- their food and coffee was AMAZING. I ordered a chocolate muffin both times and it was perfect: moist, chocolately, and the perfect size. Steven said that their Caesar salad was the best that he's ever tried, and Dan loved their "Danish specialty" pastry. Just a note- when you enter, make sure to grab a number near the registers. Our last night in Europe we decided to try out Tight. The restaurant is right off the main shopping street, but was surprisingly affordable, and really delicious. The interior was dark and cozy (I felt super hygge there!) and the service was excellent. I ordered a Brut rosé to drink and got the lamb for dinner. I don't usually feel overwhelmed by food at restaurants, but this absolutely blew me away! The lamb was cooked perfectly and was seasoned beautifully, and was paired with the most delicious cauliflower I've ever tried. Dan got a pork tenderloin dish that he loved, and Steven got the Tight burger. We were all really happy with our choice and would highly recommend Tight! The Palace was really interesting. There are four separate buildings that are each home to a different family, and an underground tunnel connects all the buildings. If the flag is raised on top of a palace (you can see the two red Danish flags above), that means the family is home. At 11:30 every day, royal guards march from Rosenborg Palace to Amalienborg to conduct the Changing of the Guard. We were lucky enough to stumble on the parade on our last day and followed them to the palace! Although many people warned me about how disappointing the Little Mermaid is, I had to visit it. I thought the statue was beautiful and refreshingly indiscreet. I'm used to huge landmarks and statues, so seeing the "symbol of Copenhagen" was a tiny statue was a great change of pace! The statue was close to a beautiful star fortress called Kastellet. There were paths to walk around, as well as cute red buildings and a windmill. Nearby was the church pictured below, and the entire area reminded me of a beautiful fairy tale cover. So beautiful, even right after it started raining! We also made our way southeast of the city to Christianshavn and visited Church of Our Saviour. This was a really interesting building with a observation tower unlike anything I've experienced before. After making our way to the first level of the tower, we were then able to climb stairs on the outside of the spire, all the way to to the top. I'm not usually afraid of heights, but walking up those stairs really freaked me out! The views from the top were amazing, and well worth the scary walk. The church's interior was also incredible. Beautiful views of Copenhagen. From the other side, we could see Malmo and the Turning Torso! My favorite building had to be Rosenborg Castle. This building was originally a summerhouse, built in 1606 but now is only used as a residence in case of emergency. The building was gorgeous from every angle, and was surrounded by a moat and huge garden (the oldest royal garden in Denmark!). Unfortunately, the flowers weren't yet in bloom (that I mentioned here),but the entire area was beautiful and serene. These gardens had a few flowers, and the hedges were perfectly trimmed. Beautiful place for a walk! As you can tell, we explored a lot in Copenhagen! It's such a walkable city (or bikable if you're in more of a hurry) that we were able to see all of the sites I was interested in, in only 3 days. I was also able to participate in my first ParkRun (if there is one near you, I highly suggest trying it out! Not only is it free, but it's fun as well). Overall, this trip to Europe was one of my favorites. I got to visit three incredible countries and spend time with some of my best friends who are doing amazing things. I always love to travel with Dan, and we had so much fun having two more travel buddies! I'm already missing Europe and the Nordic lifestyle, but I hope to go back soon. Tell me about your favorite vacations! What country would you love to visit? I'm hoping to see Ireland and New Zeland next! They look so beautiful. Linking up with Amanda for Thinking Out Loud and Treasure Tromp for Treat Yo'Self Thursday! Wowsa, Copenhagen looks amazing! I love the idea of hygge. Also the architecture! Wow! Copenhagen is close to the top of my list of cities I want to see in Europe. I've been to Europe a couple of times but never to Copenhagen or the rest of Scandinavia, and I totally want to go. It looks so beautiful (I love Scandinavian design) and interesting. That's awesome! What other places have you visited in Europe? 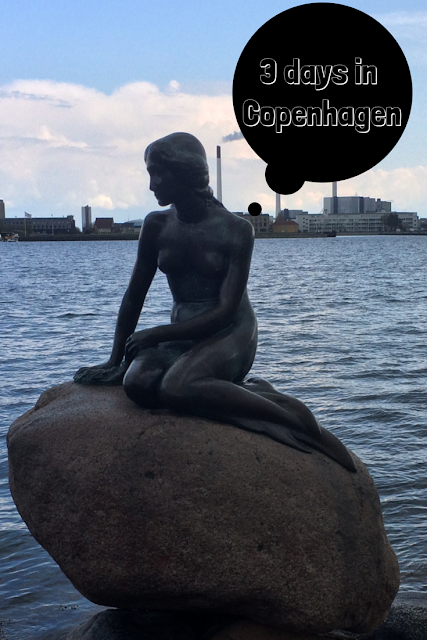 You would love Copenhagen! I would love to go back to Copenhagen and explore some more. We only had a day and a night before our flight left, so we hit the main areas and Tivoli. I want to explore some more too! I'm really sad I didn't get to go into Tivoli and a few other things. Future trip for sure! Ahhhhh my favorite city! !111 You really accomplished a lot in a short amount of time. Reading this made me want to go back so so so badly. Umm if you go back I'm tagging along lol! It was amazing for sure..thanks again for the suggestions! Excuse me while I go to copenhagen. Need the food and the hammock, and then a walk about. omg I want a hammock room now..it was seriously SO relaxing. Laying in the hammock, sipping my Carlsberg, watching some aussies play pool..not bad! Thanks Jennifer! I think I liked it a lot because everyone told me it was so disappointing, so I had low hopes and was pleasantly surprised. I just feel bad for the statue! I also read it's constantly being vandalized..what did the poor statue ever do!? So much fun! I love that you traveled here and shared as I will be there in just a couple of days!! Wow, Copenhagen is gorgeous! This is definitely inspiration to go back to Europe in NOT the middle of winter. :) Thank you for sharing!! I love Europe in winter too! Much less crowded and fantastic Christmas markets. Early spring was great as well :) Hope you can make it back soon! That looks gorgeous. I love the 'cozy' concept. I'm a big fan of cozy. And that castle looks amazing. You make me want to go now. Maybe I'll get an opportunity someday. I hope you will! It's an unbelievable city! So am I :) I'm so lucky to have someone who's as adventurous as me! We're a perfect traveling pair. Copenhagen sounds really awesome! I love the concept of hygge. It sounds like you got to see so much in all three places. I loved all your pictures! Thanks so much Jennifer! I loved sharing it all and glad that you enjoyed the posts.